Due in large part to record plantings and yield the U.S. produced 3.969 billion bushels of soybeans in 2014. Of this total, USDA’s March 10 World Agricultural Supply and Demand Estimates (WASDE) projects for the U.S. to export 1.79 billion bushels of soybeans during the 2014-2015 marketing year. The primary destination? China. Thus far during the marketing year, nearly one out of every four bushels of soybeans produced, or 13 bushels per acre, has been shipped to China. While China’s economic growth reportedly slowed to 7.4 percent in 2014, their demand for soybeans is not expected to reduce immediately (or at all). For the current marketing year, USDA projects China to import 2.7 billion bushels of soybeans worldwide, up 5 percent from the previous year. Using the average U.S. soybean yield of 47.8 bushels per acre, China’s import demand for soybeans is equivalent to 57 million acres worldwide. For comparative purposes, U.S. farmers harvested 83 million acres in 2014. Put simply, as the world’s largest importer, China’s massive appetitive for soybeans is a significant driver of global, and domestic, soybean markets. Based on USDA’s March 23 Federal Grain Inspection Service (FGIS) report, U.S. soybean exports have totaled 1.604 billion bushels for the 2014-2015 marketing year (updated through March 19, 2015). Exports to China represent 65 percent of this total, at 1.049 billion bushels. Of course, China has not always been a major player in the U.S. soybean market. During the 1995-96 marketing year China imported approximately 18 million bushels of soybeans. Since that point, and driven by rapid double-digit growth in the Chinese economy, the Chinese have enhanced their position as an export partner with the U.S. and now demand more than a billion bushels of soybeans each marketing year (Figure 1). 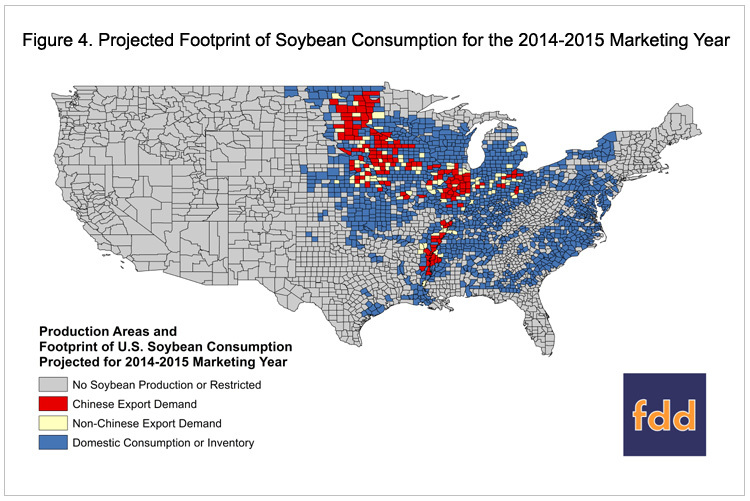 In order to demonstrate the magnitude by which Chinese demand for U.S. soybeans is felt across major soybean producing parts of the country, today’s article maps the footprint of Chinese soybean demand in the context of U.S. county-level soybean production. In 1995, U.S. farmers harvested 2.17 billion bushels of soybeans. Including beginning stocks of 335 million bushels, the total supply of soybeans was 2.51 billion bushels. Consumption of soybeans fell across two major categories: crush was 1.37 billion bushels and exports were 851 million bushels. Of the 851 million bushels exported, only 18 million bushels were shipped to China, approximately 2 percent of the total export volume. 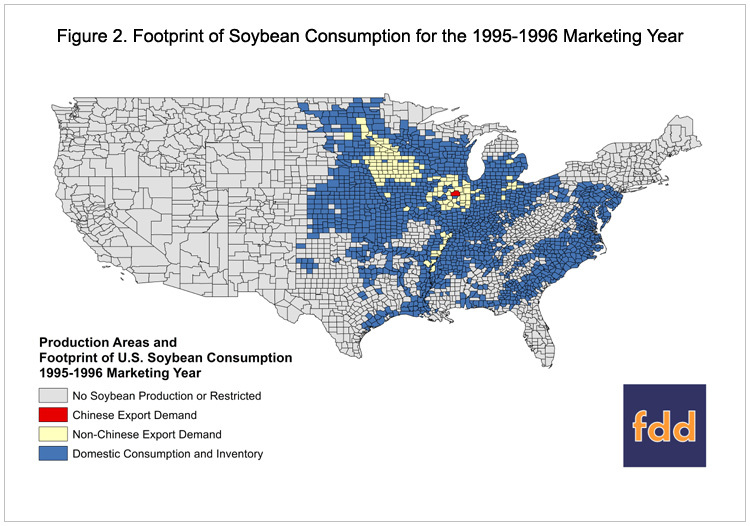 One way to visualize China’s demand for soybeans is to map the consumption categories as they relate to county-level soybean production across the U.S. Doing so shows that the footprint of Chinese demand could have been satisfied by fewer than 2 counties: McLean County, Illinois and Livingston County, Illinois (Figure 2). These two counties alone produced 25.8 million bushels of soybeans in 1995 – 7.8 million bushels more than what was exported to China. On a per acre basis, less than one-half of a bushel per acre was needed to meet China’s demand for U.S. soybeans. During the mid-2000s China’s presence in the U.S. market grew considerably. 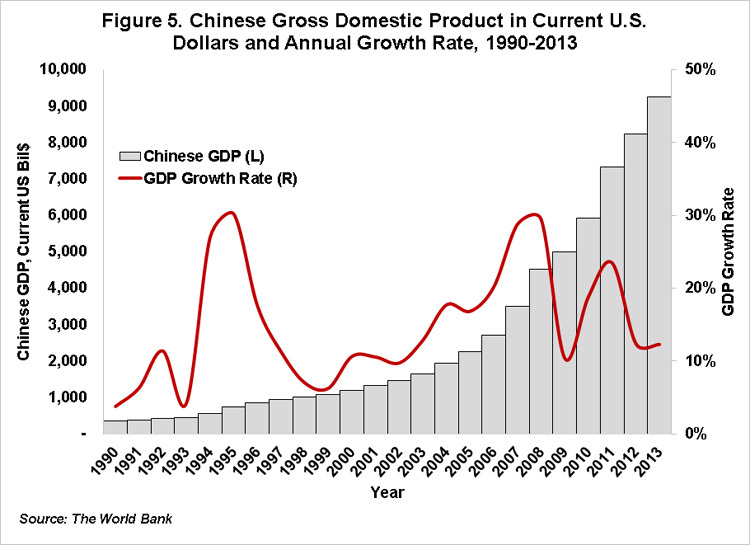 Data from The World Bank revealed that by 2007 the Chinese economy had experienced several years of double-digit growth in their gross domestic product. This economic growth led to investments in crushing capacity and improvements in food-related consumption such as soybean meal for animal feed and soybean oil for cooking. As a result, the Chinese assumed a larger role as a U.S. export partner. From the 1995-1996 to 2007-2008 marketing years the total export volume of U.S. soybeans grew by 36 percent to 1.159 billion bushels. For reasons described above, the primary driver of the growth in U.S. soybean exports was the increase in Chinese demand. During the 2007-2008 marketing year the Chinese imported 503 million bushels of soybeans from the U.S. and represented 43 percent of our total export volume (up from 2 percent in the 1995-1996 marketing year). 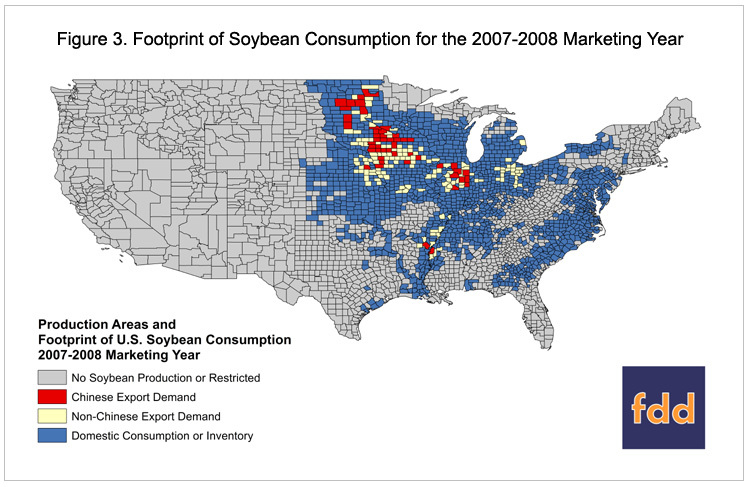 Total production of soybeans for the 2007-2008 marketing year was approximately 2.68 billion bushels. Once again, mapping the consumption categories across county-level soybean production shows that production from the top 50 counties, spanning Minnesota to Illinois, would have been required to satisfy the Chinese demand for U.S. soybeans. On a per acre basis, the Chinese demand accounted for approximately 7.8 of the 41.7 bushels per acre produced in 2007. Now, during the 2014-2015 marketing year, China’s consumption of U.S. soybeans is second only to domestic crush. Based on March 23 USDA FGIS export data, the U.S. has already exported 1.604 billion bushels of soybeans. Of this amount, more than 1 billion bushels, or 65 percent, have been exported to China. Our next closest soybean trading partner is Mexico at 73 million bushels, nearly one billion bushels fewer than China and less than 5 percent of the marketing year-to-date export volume. In order to derive an implied forecast what the total exports to China may be for the 2014-2015 marketing year the current percentage of exports to China were multiplied by the total projected export volume. This calculation results in an estimate of exports to China totaling 1.171 billion bushels for the current marketing year. This total, if realized, represents 32 percent of total soybean consumption projected by USDA. To meet this forecast of Chinese export demand production from the top 133 counties would be required. This geographic footprint spans from the Upper Midwest, through the Corn Belt, and down into the Mississippi Delta. 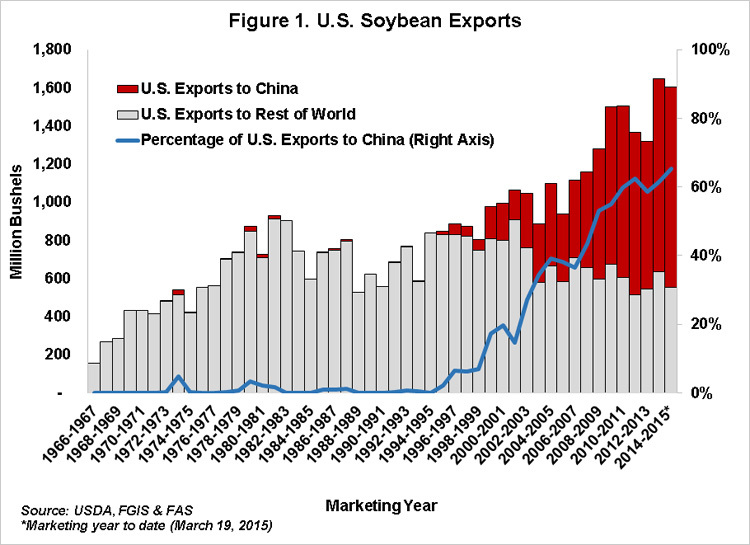 Figure 4 demonstrates the large footprint of Chinese export demand in U.S. soybean markets. Since 1995, the U.S. soybean export volume has more than doubled, with the increase in demand from China being the primary catalyst. However, China’s one-billion-bushel entrance into the U.S. market has come at the expense of other export partners (Figure 1). For example, USDA’s Foreign Agricultural Service’s Global Agricultural Trade System (GATS) census data reveals that more than 40 countries have reduced their consumption of U.S. soybeans since 1995, representing more than 400 million bushels. More specifically, exports to Japan, South Korea, and Taiwan have declined by nearly 150 million bushels since 1995. The trend toward increased consumption by China and lower consumption by other export partners makes U.S. soybean farmers increasingly reliant on Chinese demand to support domestic markets. Are all our beans in one basket? As demonstrated in this article, nearly 70 percent of U.S. soybean exports are destined for China. Then, at the county-level one-quarter of every acre of soybeans harvested in the U.S. is now required to service the Chinese demand. Should U.S. producers expect this trend to continue? This is a question not easily answered. Recent reports suggest that Chinese soybean imports could be tested by tighter soybean crushing margins. Lower, or negative, profitability in crushing margins could reduce demand for U.S. produced soybeans. Then again, several macroeconomic indicators may provide clues as we move forward. (For some perspective on the world soybean market see farmdoc daily March 13, 2015). As an example, figure 5 highlights World Bank Data on the Chinese economy. While the historical growth rates have been impressive, recent forecasts suggest the Chinese economy is unable to maintain that growth rate. In fact, China is facing a slowdown of economic growth, but not to the point of a shrinking economy. Through 2017, the World Bank forecasts year-over-year growth in China’s gross domestic product at or above 6.9 percent. These projections support China maintaining soybean consumption at or above current levels. Competition, then, with other major soybean exporters (i.e. Argentina and Brazil) would be important for U.S. producers to monitor. With respect to competition, the value of the dollar influences export opportunities as our commodities fluctuate in value relative to similar commodities produced elsewhere around the world. Monitoring these economic indicators is essential given the anticipation that U.S. farmers will plant anywhere between 83 to 88 million acres of soybeans in 2015. With the potential for yet another record soybean crop (see farmdoc daily March 19, 2015) it will be especially important for U.S. soybeans to continue finding a Chinese home if prices are expected to remain at or above current expectations. Zulauf, C. "Some Key Trends in the World Soybean Market." farmdoc daily (5):47, Department of Agricultural and Consumer Economics, University of Illinois at Urbana-Champaign, March 13, 2015. Forming Expectations for the 2015 U.S. Average Winter Wheat Yield: What Does History Teach Us?